Nothing spells “good morning” like warm and soft pancakes and there are can be so many varieties to suit everyone’s particular shade of joy. If you think your pancakes are the fluffiest, think again! Because I’ve never tasted any pancakes, fluffier, softer and happier than the ones made with this Japanese Soufflé Pancakes Recipe. My younger one got fascinated with the idea of this recipe doing rounds on Internet and wanted to make these prompt. We found two versions – the more authentic without baking powder and with a little mayonnaise. This one was trickier to make and if the temperature and timing is not spot on, the soufflé pancakes will deflate after you take them out of the mould and they taste a bit eggy. If you are not fond of a prominent egg taste and adventurous enough in the kitchen then that version is not meant for you. 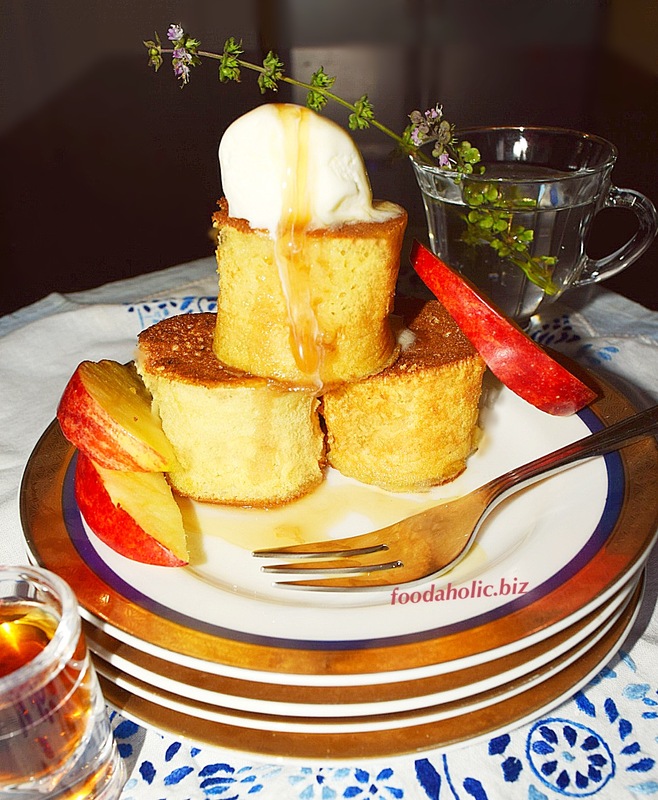 The other version is more a fusion of western style pancakes with this Japanese Soufflé Pancakes recipe. Baking powder in this recipe helps pancakes rise and maintain the fluffiness. All you really need to do with these ones is beat the egg whites separately till they form soft peaks, then gently fold them into your regular pancake batter. Pour in ring moulds and cook covered on stove top. They come out extremely soft, thick, fluffy and tall which means they soak up a lot more syrup/honey, making every bite utterly delightful. These pancakes look like crumpets and taste like a cloud that melts in the mouth – a perfect treat for any special occasion, served with custard, ice cream, maple syrup, golden syrup, honey and fresh fruits. Beat egg yolks and sugar in a bowl till sugar is dissolved. Add milk and vanilla. Beat some more to mix. Add flour mix, blend thoroughly. In a separate bowl beat egg whites with a hand or electric beater till soft peaks form. Fold egg whites gently into the batter. Grease and heat a flat griddle or frying pan on low heat. Grease the inside of ring molds. Place the molds in the pan. Pour batter into them. Fill 1/2 and leave some space for the pancakes to rise. Cover with a lid and allow to set for 4-5 minutes. Remove lid. Slide flipper under the mould to make sure the pancake is not sticking with the pan surface. Hold the mould with a pair of tongs or oven mitten. Flip to cook the other side. Repeat with all. Cover again and cook another 3-4 minutes. Cooked pancakes should be golden brown on both sides and springy but firm to touch when pressed lightly. Serve warm with a drizzle of honey or maple syrup and a scoop of ice cream or some fresh fruit on the side. Makes 4-6 pancakes depending on the size of ring moulds. Thank you so much, Linda! 😊 The pancakes are very light in themselves. A couple of these fluffy pancakes with lots of fresh fruit and some jam or Greek yogurt make a very satisfying breakfast.